The map above shows the largest self-reported national identity group by share of population for each local authority area of the United Kingdom in the 2011 Census. Please note that respondents were allowed to select multiple national identities at the census and that as such these identities are interchangeable. For example, 26% of people from East Renfrewshire in Scotland described their national identity as both Scottish and British. 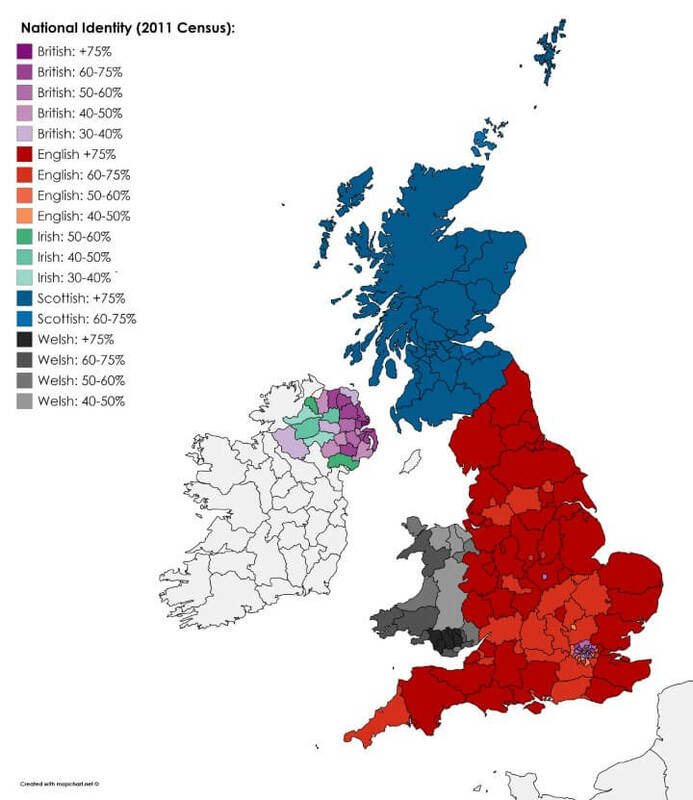 ‘Northern Irish’ identity actually outnumbers ‘Irish’ in Northern Ireland, however it is more evenly spread throughout the country and is outnumbered by British/Irish identities in all regions. It tends to be stronger in more moderate parts of Northern Ireland such as Down and North Down, and among more moderate Roman Catholics and atheists/non-religious in particular who don’t actually want to break away from the UK. That British spot in the middle of England, is that Leicester? What’s special there that they identify as British? Perhaps due to the large Indian communitiy in Leicester. Identify as British Asian rather than English. Lower English % in London, W.Yorks, G.Manc and W.Mids with large BAME populations too. The large ethnic minority population in Leicester would identify mainly as British rather than English. I think it is Leicester. Many people whose families originate from former Commonwealth countries will tell you they are British but few would say they are English. I would imagine Leicester has a significant proportion of such people. Larger cities, e.g Birmingham, are more diverse with many people settled there from non former Commonwealth countries, each with its own identity. What is a ‘moderate Roman Catholic’? Not sure moderate is the correct term for what is being labelled. A pity that UAs and LBs are shown, but not MBs.